Work with this school began in January 2016 in preparation for the main event on 14th March. Students from the school learned about the issues surrounding human trafficking and started a project to raise funds for ITLR and discuss human trafficking in classrooms. On 14th March, an assembly was held with over 100 students giving them more information about human trafficking in Northern Ireland. A run with students was undertaken later in the day at the school and a balloon release. ITLR were supported at this event by FREEDOM ACTS and STOP THE TRAFFIK Lisburn. The ITLR team took the opportunity to publicise the work of ITLR in the city centre in their branded shirts handing out leaflets to a large crowd gathered for the traditional St Patrick’s Day Parade. St Patrick was thought to be one of the first people trafficked to Ireland as a slave in the 5th Century. 4 members of the ITLR team successfully completed the Castlebar duathlon (run 5.8k, cycle 29k, run 5.2k). Organisers supported the project by advertising the work of ITLR on their facebook page, by providing bikes and entry free to the event, allowed ITLR to put up their awareness raising materials and hand out leaflets. Project Director Kate Bulpit was given the opportunity to do 2 Radio Interviews campaigning against Human Trafficking in this locality but came last in the event! Reggie from Oasis South Africa and Emma from Oasis Belgium made it look easy. Hard on the heels of the duathlon the team then moved across to the west of the ROI and entered the Wicklow 10k Goal break on the other side of the country. More sponsorship raised. With free entry again from organisers, they generously supported the campaign through their PA system at the event. More leaflets handed out and the opportunity taken to talk trafficking issues with a large crowd that had gathered to either compete in the event or support competitors. Work with this school had again begun in January 2016. 2 assemblies were held giving students more information about human trafficking in Northern Ireland. A run with students was undertaken later in the day at the school and a balloon release. ITLR were again supported at this event by FREEDOM ACTS and STOP THE TRAFFIK Lisburn. The Mayor of Armagh City Banbridge & Craigavon Borough Council, Darryn was generous with his time when he invited the ITLR team to his offices to discuss local human trafficking issues and publicising our campaign. On a rather wet and blustery afternoon around 60 members of the local community turned up to support ITLR and FREEDOM ACTS in their joint event to raise awareness about human trafficking. 2 members of staff and 3 students from Oasis Academy Mayfield arrived in Ireland in time to join in the Community 5k Fun Run around Craigavon Lakes. Working with FREEDOM ACTS and the Department of Justice for NI, ITLR had the opportunity to arrange an event at Stormont to meet with politicians and numerous other anti-human trafficking organisations across Ireland. The event was supported by the NI Minister for Justice, David Ford, and Kevin Hyland OBE the first UK Independent Anti-Slavery Commissioner as well as the CEO of STOP THE TRAFFICK, Ruth Dearnley OBE. An iconic campaign run up the hill was started by Dame Mary Peters OBE before Oasis Anti-Trafficking balloons were released as a mark of respect for those across the world who have been affected by the crimes of Human Trafficking and Modern Day Slavery. The occasion gave anti-trafficking agencies and NGOs across Ireland the chance to network, discuss ideas and approaches, and to question officials with regard to their intentions on how they would be aiming to prevent trafficking in the future and provide better support and legal protection for victims. Local and National Press attended and reported on the event. The ITLR team climbed Slemish Mountain where St Patrick is reputed to have been kept as a slave for 6 years working as a shepherd. A more challenging climb than expected but a fantastic view from the top. A sponsored 10k run was then undertaken later in the day in the local area. The first run for 2 new ITLR team arrivals. Very hilly and theweather fairly bleak. 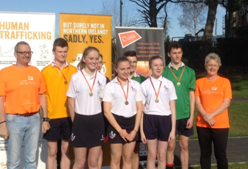 12 orange ITLR shirts took part in the Messenden 10k Challenge called ‘Take on the Castle. It was a challenging hilly course, around roads, cross country and along the beach. Organisers had promoted our campaign across their website and social media sites and they welcomed us at the event, allowing us to put up display units, hand out leaflets etc. Working with STOP THE TRAFFKIK, Ballymena Group, ITLR then cooked dinner for 60 and hosted a fundraising evening of information sharing, music and dance at the Slemish Barn Hostel where the team were staying supported by the Hostel owners and the Derry and Antrim Fiddlers. The weather wasn’t kind as hail stones viciously attacked runners as theyslogged out their 10k run – general feeling though, “this is nothing compared to the pain inflicted on people through human trafficking”. Luckily the weather did improve for the second run, allowing the beautiful countryside to be seen in the sunshine. Tough going though because of the hills. First stop was to attend the Donegal Youth Services Conference. Informing young people about the nature and dangers of human trafficking. Later in day the team contributed to a session with young people on how social exclusion can lead to mental health problems and exploitation – and how in some cases, in some places, this can lead to vulnerable people being trafficked. Having Reginald Kiti from Oasis South Africa with the team enabled discussion on the issue from a global perspective. Last week Phil Lane and Luke Newman from ’In the Long Run’ (ITLR), Oasis Belgium addressed a morning workshop on Human Trafficking hosted by Donegal Youth Council and facilitated by Donegal Anti-Human Trafficking Group ( DAHTG). ITLR raises awareness and campaigns against human trafficking through its unique format of undertaking long distance, endurance runs along major international human trafficking routes. Phil’s key message was “Firstly, treat women as your equals. Secondly, do not let anyone be isolated, be that in school, college, workplace or your community. Always time though for a final sponsored 10k run through the streets of Letterkenny. Project ended – Thursday 31st March and the remaining team members returned to the UK, Belgium and South Africa.